Patients with breast cancer with estrogen receptor ≥1% need to be treated with suppression or ablation of ovarian function. Suppression can be achieved with tamoxifen. Other endocrine therapy options include aromatase inhibitors ( letrozole, anastrazole and exemestane) and progestogens. Ablation is achieved with GnRH analogs or therapeutic oophorectomy. 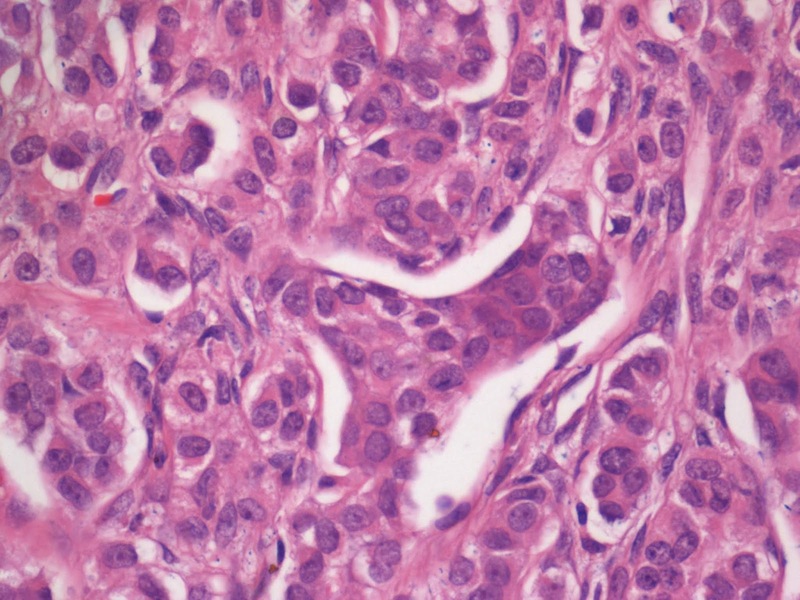 We report a case of metastatic breat cancer who was found to have left ovarian metastasis when there was no suspicion of the same on clinical examination as well as on inspection of the ovary during her operation. Premonopausal women with hormone-sensitive breast cancer benefit from endocrine therapy. Salpingo-oophorectomy is more effective than tamoxifen as adjuvant therapy. Such salpingo-oophorectomy is distinct from that performed as a debulking procedure in case of ovarian metastases from a breast cancer. 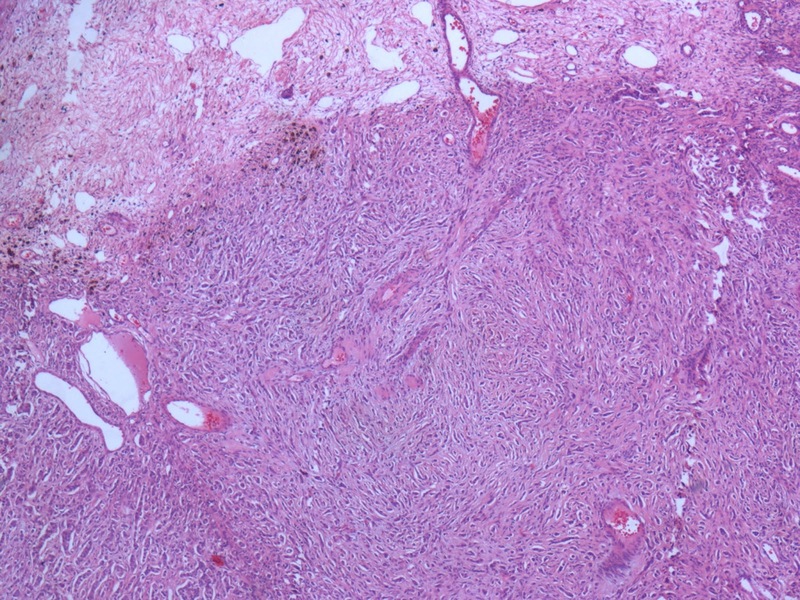 We present an unusual case of microscopic ovarian metastasis in the left ovary of a case of metastatic breast cancer. A 35 year old woman, para 2 living 2, was referred to us from an oncology center for bilateral salpingo-oophorectomy in view of metastatic breast carcinoma which was being treated with combination chemotherapy. She had menarche at the age of 13 years. Her past and present menstrual cycles were every 28-32 days, regular and with moderate flow. Her last menstrual period had been 2 weeks ago. She had two normal deliveries, 9 and 6 years ago. She had successfully breastfed both babies for a year each. She was a known case of breast carcinoma. She was receiving cyclophosphamide-methotrexate-5-fluorouracil chemotherapy. Being estrogen receptor positive, she was advised to undergo bilateral salpingo-oophorectomy. Her general condition was fair. Her general and systemic examination revealed no abnormality clinically. Abdominal and bimanual pelvic examination showed normal findings. Her liver was mildly enlarged. Chest radiograph showed small metastases bilaterally. Ultrasonography of the abdomen showed mild hepatomegaly, small calcified granulomas in the liver and normal intraabdominal and pelvic organs. Her liver and renal function tests showed normal results. Investigations for fitness for anesthesia showed normal results. The patient opted for minilaparotomy for bilateral salpingo-oophorectomy rather than laparoscopy. It was performed under spinal anesthesia. Both fallopian tubes and the right ovary were normal. 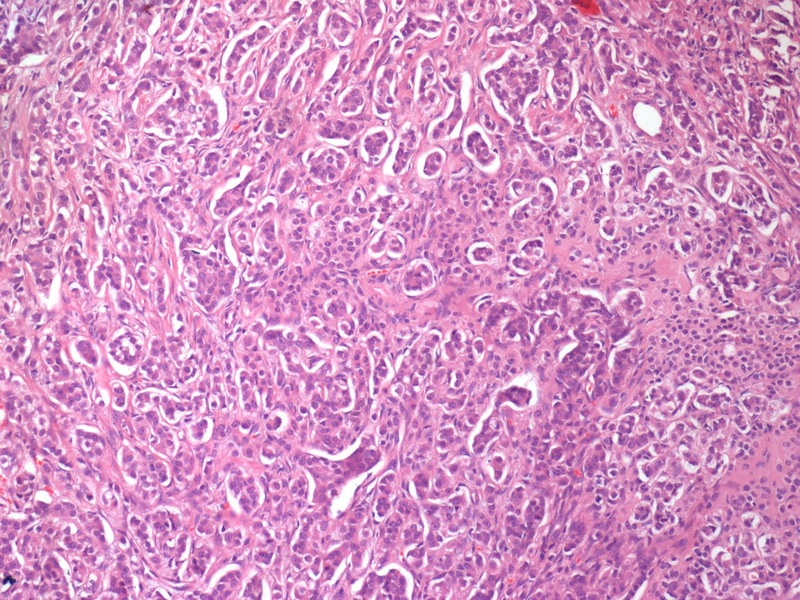 The left ovary was mildly enlarged, but otherwise normal in external appearance. Its cut surface showed a yellowish nodule measuring 0.8 cm in diameter. The patient made an uneventful recovery from the surgery. 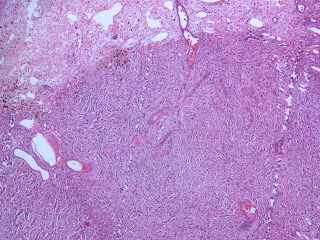 Histopathological examination of the surgical speciment showed normal fallopian tubes and right ovary, and the left ovary showed infiltrating ductal carcinoma. The patient went back to the oncology center for continuation of her treatment. Figure 1. Histopathology: Scan - Normal ovarian parenchyma in the periphery with a circumscribed nodule ( HE x40). Figure 2. Histopathology: Low - Tumor cells arranged in nests, cords and small tubules amidst cellular stroma (HE x 100). Figure 3. High: Tumor cells have high nuclear:cytoplasmic ratio, scanty cytoplasm and occasional prominent nucleoli (HE x400). George Thomas Beatson ( 1895) first performed a bilateral oophorectomy for breast cancer. He reported three patients treated in this manner. The addition of ovarian ablation or suppression to any systemic therapy for breast carcinoma is associated with a significant reduction in recurrence and death. It improves both disease-free survival and overall survival of premenopausal women as compared to treatment without adjuvant therapy. [5.6] Premenopausal women with estrogen receptors in the tumor benefit from ovarian suppression by both GnRH analogs and bilateral salpingo-oophorectomy. The latter has the advantages of much lower cost and absence of adverse effects of GnRH analogs. Chemotherapy can cause ovarian failure, but that effect depends on the patient's age - younger women tend to develop permanent ovarian failure less often. Thus one cannot rely on that effect and must achieve ovarian suppression or ablation. Ovarian metastases are found in 10-20% autopsies done in cases of ovarian carcinomas. They are found in 30% cases of therapeutic oophorectomy specimens of breast carcinoma cases. [7,8,9] Ovarian metastasis from breast carcinoma can appear many years after the initial diagnosis, the median time being five years. Early diagnosis and treatment of ovarian metastases is important in improving survival of these cases. These can be detected when they cause gross lesions. In the case presented, the metastasis was not detectable clinically and would have been missed had bilateral salpingo-oophorectomy not been performed therapeutically to aid treatment of the breast carcinoma. Thus it was not only curious to find it, but was also in patient's interest – it served the purpose of ovarian ablation and also reduced the tumor burden so that chemotherapy would work better. It also improved prognosis as the metastasis would have been detected later when it had grown enough to be detectable grossly on imaging. Usually metastatic tumors from breast carcinoma are small in size, as in our case. Aebi S, Davidson T, Gruber G, Cardoso F; ESMO Guidelines Working Group. Primary breast cancer: ESMO Clinical Practice Guidelines for diagnosis, treatment and follow-up. Ann Oncol. 2011 Sep;22 Suppl 6:vi12-24. American College of Obstetricians and Gynecologists. Elective and risk-reducing salpingo-oophorectomy. Washington (DC): ACOG; 2008 Jan. (ACOG practice bulletin; no. 89). Obstet Gynecol 2008 Jan;111(1):231-41. Love RR, Philips J. Oophorectomy for breast cancer: history revisited. J Natl Cancer Inst. 2002 Oct 2; 94(19):1433-4. LHRH-agonists in Early Breast Cancer Overview group., Cuzick J, Ambroisine L, Davidson N, Jakesz R, Kaufmann M, Regan M, Sainsbury R. Use of luteinising-hormone-releasing hormone agonists as adjuvant treatment in premenopausal patients with hormone-receptor-positive breast cancer: a meta-analysis of individual patient data from randomised adjuvant trials. Lancet. 2007 May 19; 369(9574):1711-23. Early Breast Cancer Trialists’ Collaborative Group. Effects of adjuvant tamoxifen and of cytotoxic therapy on mortality in early breast cancer: an overview of 61 randomized trials among 28,896 women. N Engl J Med. 1988;319:1681–1692. doi: 10.1056/NEJM198812293192601. Early Breast Cancer Trialists’ Collaborative Group. Effects of chemotherapy and hormonal therapy for early breast cancer on recurrence and 15-year survival: an overview of the randomised trials. Lancet. 2005;365:1687–1717. Petru E, Pickel H, Heydarfadai M, Lahousen M, Haas J, Schaider H, et al. 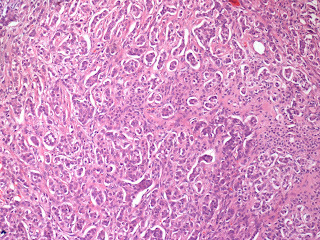 Nongenital cancers metastatic to ovary. Gynecol Oncol. 1992;44:83–86. Mazur MT, Hsueh S, Gersell DJ. Metastases to the female genital tract. Analysis of 325 cases. Cancer. 1984;53:1978–1984. Hann LE, Lui DM, Shi W, Bach AM, Selland DL, Castiel M. Adnexal masses in women with breast cancer: US findings with clinical and histopathologic correlation. Radiology 2000;216:242–247. Bigorie V, Morice P, Duvillard P, Antoine M, Cortez A, Flejou JF, et al. Ovarian metastases from breast cancer: report of 29 cases. Cancer 2010;116:799–804. Jiang R, Tang J, Cheng X, Zang RY. Surgical treatment for patients with different origins of Krukenberg tumors: outcomes and prognostic factors. Eur J Surg Oncol 2009;35:92–97. Kim WY, Kim TJ, Kim SE, Lee JW, Lee JH, Kim BG, et al. The role of cytoreductive surgery for non-genital tract metastatic tumors to the ovaries. Eur J Obstet Gynecol Reprod Biol 2010;149:97–101. Koyama T, Mikami Y, Saga T, Tamai K, Togashi K. Secondary ovarian tumors: spectrum of CT and MR features with pathologic correlation. Abdom Imaging 2007;32:784–795.